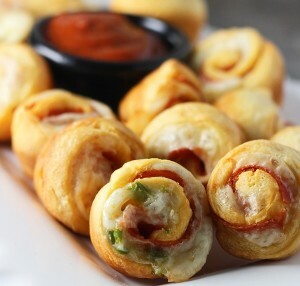 Pizza Poppers: Pizza poppers is basically a roll out the pizza dough, cut it into squares, top it with your favorite pizza ingredients, wrap the up and fry them. Each pizza popper is a perfect one biter! And perfect for evening parties and goes well with a cold beer. Pizza poppers are very easy to make and take no more than 15 minutes. Spray two mini muffin tins with non-stick olive oil spray. When you unwrap the crescent roll package, separate the four rectangles (these also breakdown to triangles). If they fall apart, that’s fine, just put them back together. You should have four even rectangles. Slightly roll out the dough horizontally and vertically. Sprinkle 1/4 cup of the mozzarella on each rectangle and then sprinkle with a little bit of chopped green pepper. Layer the pepperoni on top of cheese and peppers. There should be three rows of four pepperonis each. Tightly roll, jelly roll style and cut each rectangle into six pieces. Place poppers, cut side down into mini muffin tins. Bake for about 10 minutes or until crescent roll dough is cooked through and pale brown. Serve the pizza poppers with warm pizza sauce. If you have any queries regarding the Pizza Poppers recipe, please leave a comment.